Mothers line up to register their children in Rwanda after fleeing their native Burundi. The number of Burundians seeking refuge in neighbouring countries has surged in recent weeks following an uptick in pre-election violence and intimidation throughout the African nation, a spokesperson for the United Nations refugee agency (UNHCR) said today. Briefing reporters in Geneva, Adrian Edwards warned that more than 8,000 Burundians had sought refuge in Rwanda and the Democratic Republic of the Congo (DRC) over the past 14 days amid intensifying harassment and reported disappearances of people associated with the political opposition. Earlier this week, during his visit to Burundi, UN High Commissioner for Human Rights Zeid Ra’ad Al Hussein confirmed that recent events in the country were of great concern, with tensions rising sharply over the past few months as the elections approach, reportedly stoked by an increase in politically motivated harassment, intimidation and acts of violence, as well as a reported rise in hate speech. In addition, he urged politicians and activists to ensure that the country’s political debate did not transform into incitement or violence, and urged those competing in the election to do so fairly and graciously. With political tension rising throughout the country and more acts of violence being reported, the UNHCR official continued, concerns are increasing regarding the possibility of more people fleeing in the lead up to the elections, which are slated to take place from May to July. Mr. Edwards noted that the bulk of those fleeing in the past two weeks – some 7,000 people – had sought refuge in Rwanda with more than 60 per cent of them being children. Meanwhile, in the DRC, over 1,000 Burundian asylum-seekers had arrived in South Kivu so far this month. As a result, UNHCR and its partners on the ground are working to provide basic assistance at refuge centres in both countries, distributing essential items such as plastic sheets, mosquito nets, blankets, mattresses, jerry cans and soap to help families cope. 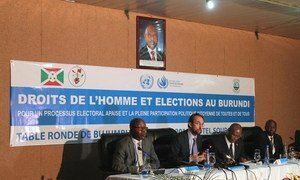 The United Nations human rights chief said today that inside and outside Burundi, stakeholders are extremely concerned about tensions rising sharply as a series of pivotal elections set to take place between May and August this year get under way, and, with the country at “a crossroads,” Burundian parties must choose the path to democracy and the rule of law.